I came home this weekend to find that the water pump that goes from our outside tank to the house was no longer functioning. One of the daily challenges that we deal with in Nairobi is that water is both unreliable and – when available – delivered at very low pressure. At our house we have one pump that goes from the city line to our outside tank and then a separate pump that goes from the outside tank into the tanks that are located in our attic. When we moved into the house both pumps were controlled manually and it was not uncommon to run out of water in one part of the house – usually the showers – when we would forget to turn the pump on. I eventually bought a very nice industrial pressure control valve that would automatically turn on the pump whenever the water level dropped below the cutoff for the float valves. It wasn’t a cheap control valve – in fact it was quite expensive. I chose to invest in an industrial quality unit so that it would withstand the environmental realities of Kenya. Needless to say, it failed. Not just a little failure, but a complete and total meltdown – literally. It all started with a very bad storm on Saturday. Our power was out several times and we woke up on Sunday to our fans running very slowly and the lights glowing very dim. I didn’t measure the voltage but I would guess we were running about 100V on a 220V circuit. We spent the morning at church and didn’t get back to the house until later in the afternoon. Everything was back on and we assumed that all was well. It was only on Monday morning when the showers didn’t work that we realized there was an issue. Our pump wasn’t running. After confirming that power was being supplied, I pulled the control valve off and opened it up. You can see the results in the photos. Complete and unrepairable electrical devastation. The unit was fried. I am guessing that we had a serious power spike at some point in the day and this unit wasn’t sufficiently engineered to handle the results. I don’t know the specs on the components or how well engineered the device was but in reading the ashes I can only surmise that the sizable relay failed and sent 300V+ into the circuit board. 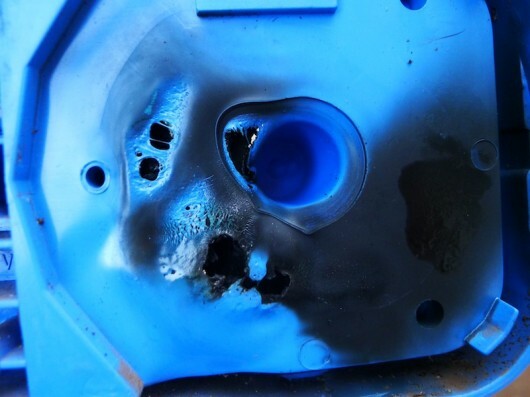 Even in the ashes I can tell this is a well built device and I am sure that the EE who designed it was confident that all of the components could withstand normal operating conditions for a 220V industrial appliance – including some standard margin of error. 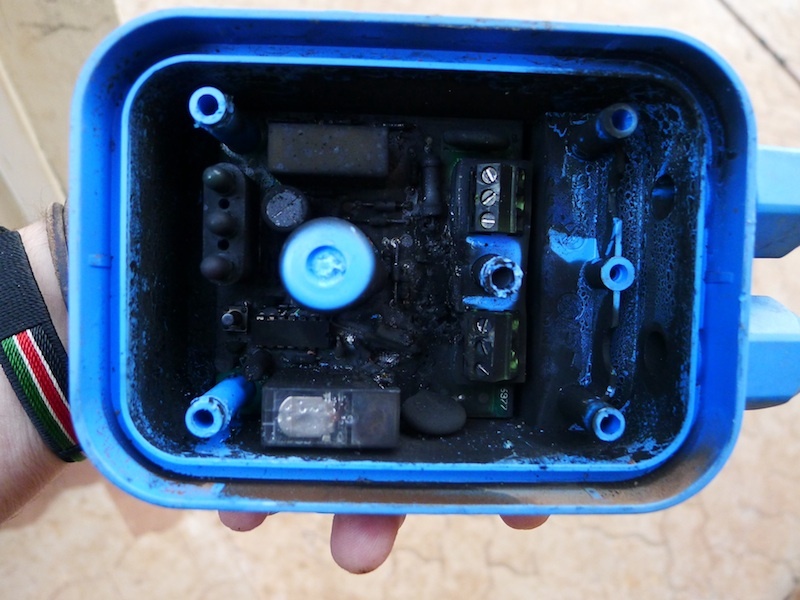 However, that EE likely has never witnessed the realities of power spikes that blow lightbulbs, fry computer power supplies, and generally wreak havoc on any electronics in Africa. I trust that if he had, he would have probably thought differently about his design and the specification of the components for his device. This experience only reenforces one of our core premises at BRCK: you can’t effectively engineer for the realities of Africa if you don’t experience the realities of Africa. Early in the process of designing the BRCK we identified smart power management as being one of the key features that needed to be incorporated throughout the device. 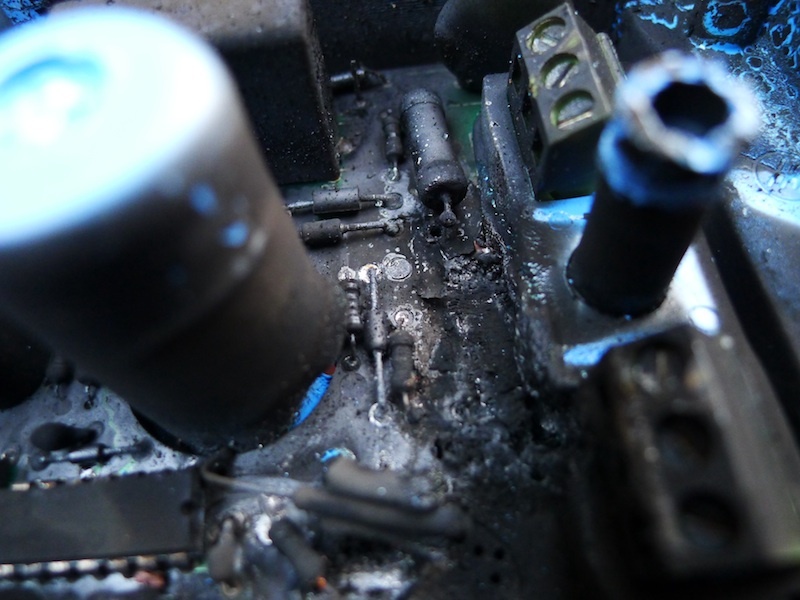 Not just smart in the sense of keeping the onboard LiPo charged but smart in the sense of not turning to ashes when the power company goes off the rails. We know that power in Africa will always be unreliable and of poor quality, why shouldn’t our devices be engineered to handle it?